From across the room, he noticed her elbow. Such an exquisite elbow. What fine lines. As he traced the curve of her elbow with his eyes, he noticed something stenciled there. At this distance, he should not have been able to tell that that something was a flower. But he could, so he gave up reasoning for reality. His eye started tracing the lines of the flower. He was only vaguely aware that the flower was drawn on a woman's elbow some 20 yards away. Suddenly, his laptop got heavier, almost dragging him down. He thought that must have been due to all the data he had recently downloaded. Strange thought. The lines of the flower slowly, but surely, turned into a descending, spiraling staircase. Pink polka-dots were never so welcome! Hmmm, this stairwell traveling could come in handy, I wonder what other stairwells...You mean hells don't you, quit thinking that way! This is one of the strangest books I have encountered in a very long time. It chronicles the adventures of a young man who becomes interested in the tattoo on a woman's elbow. He, and the story, jumps from place to place and event to event, but it all makes a bizarre kind of sense - perhaps more so after a glass or two of wine or a toke or two ... if that sort of thing is legal in your neck of the woods. In any case, it's very short, so worth a look, if only for the experience. Personally, I enjoyed it although I continue to be puzzled by it. This book just didn't seem to go anywhere. The main character is trapped for a while and the whole story revolves around his internal monologue. IDK if the author was watching Castaway while writing? I did feel like the computer was his Wilson lol. I'm left scratching my head thinking what the heck!! The narrator wasn't bad. He's just doing the best with what he's got to work with. I was given a free copy of this book at my request and have voluntarily decided to leave this review. This book is an MC Escher drawing turned onto a book. 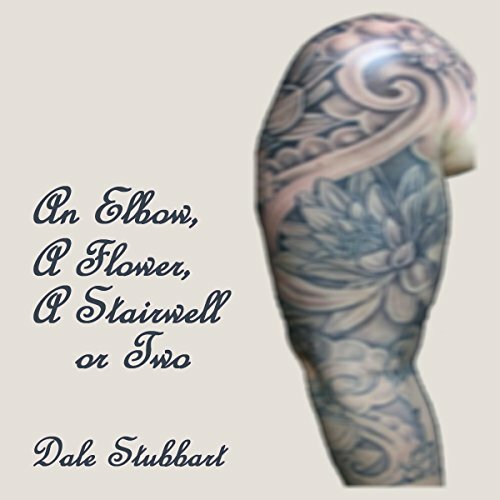 A tattoo melds into a staircase, the staircase into another world. Scene change in an instant. The protagonist, and the reader, are constantly thrown off as to where they are and what is going in a swirl on non sequitur and constant change. And yet, it's generally an enjoyable ride. I listened through this twice, to see if I could work out what exactly is going on with the constant swirl. Is it drugs? is it virtual reality? is it insanity? Or something else? And while there is some suggestions at the end as to what was the cause, it's never made clear. I think the best way to enjoy this is revel in the insanity of what is going on and just enjoy the ride. Yes, try work it out, but more just get swept along with it. There is some things that felt off in the writing. Midway through the book it changes from a third person point of view to first person. Maybe it was intentional, maybe part of the 'keep the reader off kilter' approach, but didn't sit well. Narration by Gareth Johnson is good. It has an energy to it that works really well with the text, while still being well paced and clear. Short, confusing, intriguing. Worth a listen. This can be a confusing story -- especially since it's told at such a rapid, and sometimes jarring, pace. I think that's somewhat intentional, but it is what it is. Because I think the author intended this as sort of a long-form poem where you're to figure out and understand what's going on, I don't want to ruin anything. It's short enough at 27 minutes for you to give it a try anyway. The narration was also a bit jarring at times and a bit hard to follow, but it may be due to my own unfamiliarity with the type of accent. I bumped it a star up overall since it did leave me thinking for a bit, and I do think it's worth a listen. It's also a bit jarring and forgettable after a bit of pondering IMO. I was provided this audiobook free of charge in exchange for my honest review. This is a strange work but if you are interested in a unique and creative work then this may be for you. The Narrator did a good job with the material. Polka dots have never been so welcome. A twenty day adventure in about as many minutes. Just don't trace the staircase. Weird, and with the perfect dorky reading by very English voiced Gareth Johnson, making the whole entertainment totally surreal. I was attracted to this book by the title, requested and, to my delight, freely gifted a complimentary copy via Audiobook Boom by the rights holder. Thank you so much. It was great fun. So... not sure what I just listened to. The narrator has a good voice, but I just felt lost the whole time. It is rapid to the point of being jarring and it is just left me thinking, "what the hell did I just listen to?" This is a quite weird book. I got a little lost at the beginning, despite its simple language. But it's definitely well written. Recommended if you want to try something different.